"Bizarre" design representing an underwater fantasy, consisting of double vertical rows of serpentine, branching bands with occasional abstract and diapered shapes along the "trunks," framing a group of abstracted, rock-like shapes, from which sprout long, curved, spiky leaves and a thick stem intertwining with the wider bands, branching exotic flowers, fruits, leaves and shells; the entire pattern echoed and complimented by the ground patterning. Four pieced lengths, sewn together along the selvedges to form a large rectangle, edged with gilded metal and yellow silk galloon trim (1 3/4 inches wide with a repeating leaf and flower design), backed with red plain weave silk taffeta. This example in the late bizarre style features an underwater fantasy complete with aquatic plants and shells. The fabric was probably originally used for an ecclesiastical vestment and later pieced together as a decorative panel. Between about 1690 and 1720, the new fashion in European silks was characterized by unconventional, abstract designs that combined influences from the Middle East and Asia with the extravagant taste of the European courts. These silks, given the name "bizarre" in the twentieth century, frequently juxtapose adaptations of the chinoiserie and indienne motifs that were popular at the time with unusual forms resulting in particularly inventive patterns. With their exceptionally long repeats, such silks were used for furnishings, upholstery, and vestments as well as for fashionable clothing, since the length of the repeat was particularly well suited to the long slim silhouette of the period. 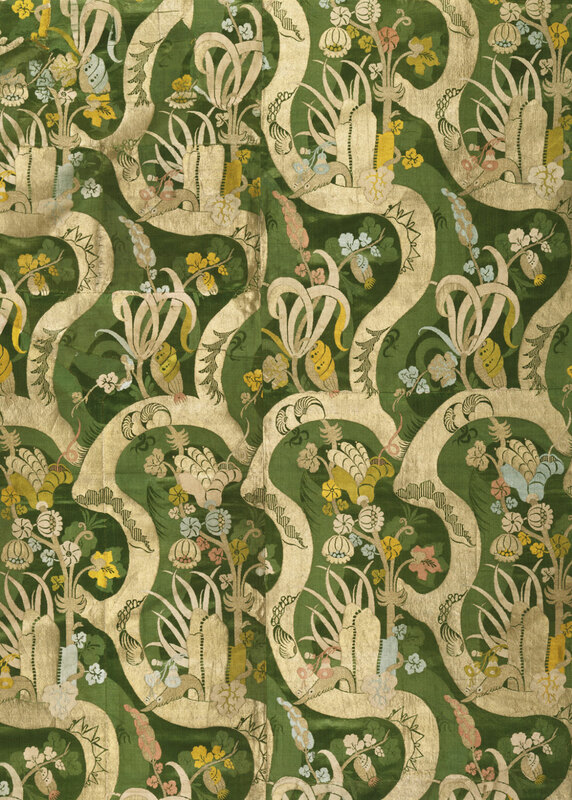 The silk is decorated with abstracted rocklike shapes from which sprout long, curved, spiky leaves and thick stems intertwined with branches of exotic flowers, fruits, and leaves. Its damask background, patterned with extra wefts of colored silks and gilded threads, would have reinforced the fabric's status as a highly prized luxury good. Dilys Blum, from Philadelphia Museum of Art: Handbook of the Collections (1995), p. 82.